Pathways can be great decorative elements for a waterfront property. Here are three types to consider adding this spring! Your beautiful custom home was built to last with you in mind. You have your dream home with that perfect view. Now, it’s time to make your property match the gorgeous home and view. One of the ways to do that is to put in gardens, which are perfect for spring. Another thing you can do is add pathways to your waterfront property. Here are a couple of the different types of pathways you can add. 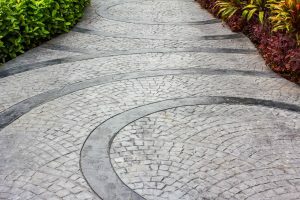 Natural stone and stone paver pathways are extremely popular for many reasons. They are beautiful, durable, and versatile. Pavers can easily be rearranged to go where you want them to. You can use stones and pavers to create pathways through your gardens and have your own oasis right there on your waterfront property. A lot of times when a property is on the waterfront, there is some sort of hill on the property that leads down to the waterline. Whether you have a slow, gradual slope or a more steep incline, stairs can make the hill much easier and safer to traverse. While you probably don’t have enough space for a couple of miles of beachfront shops, food, and games, you can have your very own scaled-down boardwalk on your waterfront property. Maybe you want a path that leads from the deck to the pool so you can keep grass out of the filter, or an easy way to get right out to the water, or maybe even an easy way to stroll from the deck to the gazebo. You can have wooden walkways built to get to the different areas of your waterfront property. Just keep in mind that the outdoor conditions in a waterfront area can age the planks much faster than other environments so inspect your boardwalk regularly! This entry was posted on Friday, March 22nd, 2019 at 8:00 pm. You can follow any responses to this entry through the RSS 2.0 feed. You can leave a response, or trackback from your own site.